Dexterity - Left Handed. Nothing drastic on the face that will impact club performance. Loft - 15 . 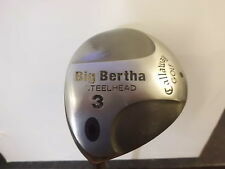 Up for auction I have a left-handed Callaway Big Bertha fairway wood. Pictures are of the actual club. It has a Memphis "10" steel shaft.Golf Pride grip in good condition. I have club measuring 42 inches long. No head cover. $10.00 S&H TO THE US. Callaway X Fairway Wood 19° Uniflex Left-Handed Steel. Flex Uniflex. Fairway Woods. Type Fairway Wood. Grip Callaway Golf. Shaft Material Steel. Shaft Condition 8.0 / 10. That simple! Callaway STEELHEAD Fairway 3 Wood Regular Left-Handed Steel. Model STEELHEAD. Fairway Woods. Type Fairway Wood. • Hawk Eye soleplate glides over the grass without digging, and makes this driver playable off the fairway. Callaway X Fairway 3 Wood 15° Uniflex Left-Handed Steel. Flex Uniflex. Fairway Woods. Type Fairway Wood. Grip Callaway Golf. Shaft Material Steel. Loft 3 Wood 15°. Shaft Condition 8.5 / 10. Grip: Original Callaway. Dexterity: LH. Shaft Condition: Good. You are receiving the exact club pictured. 2004 Big Bertha. Fairway Woods. Shaft Type. Shaft Notes. Shaft Flex. We do provide images of the actual shaft for all of our golf clubs to help better identify the exact shaft in the clubs. Head Covers. Callaway X Fairway 5 Wood 19° Uniflex Left-Handed Steel. Flex Uniflex. Fairway Woods. Type Fairway Wood. Shaft Material Steel. Loft 5 Wood 19°. Shaft Condition 8.0 / 10. That simple! Fairway Woods. Shaft Type. Shaft Notes. Shaft Flex. We do provide images of the actual shaft for all of our golf clubs to help better identify the exact shaft in the clubs. Head Covers. What shaft is in the club?. Callaway STEELHEAD PLUS Fairway 3 Wood Stiff Left-Handed Steel. Model STEELHEAD PLUS. Fairway Woods. Type Fairway Wood. Grip Callaway Golf. Flex Stiff. Shaft Material Steel. Loft 3 Wood. Callaway X Fairway 3 Wood 15° Regular Left-Handed Steel. Fairway Woods. Type Fairway Wood. Shaft Material Steel. Loft 3 Wood 15°. Shaft Condition 8.5 / 10. They will show normal wear from frequent play and may have natural scratches, pop up marks and/or bag wear on the shaft. Callaway X Fairway Wood 15° Uniflex Left-Handed Steel. Flex Uniflex. Fairway Woods. Type Fairway Wood. Grip Callaway Golf. Shaft Material Steel. Shaft Condition 8.5 / 10. That simple! Callaway X Fairway 5 Wood 19° Uniflex Left-Handed Steel. Flex Uniflex. Fairway Woods. Type Fairway Wood. Grip Callaway Golf. Shaft Material Steel. Loft 5 Wood 19°. Shaft Condition 8.5 / 10. Callaway S2H2 Fairway 3 Wood Regular Left-Handed Steel. Model S2H2. Fairway Woods. Type Fairway Wood. Grip Callaway Golf. Shaft Material Steel. Loft 3 Wood. Shaft Condition 7.5 / 10. Callaway STEELHEAD PLUS Fairway 5 Wood Uniflex Left-Handed Steel. Flex Uniflex. Model STEELHEAD PLUS. Shaft Callaway Golf Steelhead III. Fairway Woods. Type Fairway Wood. Grip Callaway Golf. Shaft Material Steel. Callaway X 2008 Fairway 3 Wood 15° Uniflex Left-Handed Steel. Flex Uniflex. Fairway Woods. Type Fairway Wood. Shaft Callaway X. A modified X-Sole Design featured in the X Fairways lowers the leading edge, providing clean turf interaction from the rough or fairway. Callaway STEELHEAD Fairway 5 Wood Uniflex Left-Handed Steel. Flex Uniflex. Model STEELHEAD. Fairway Woods. Type Fairway Wood. Grip Callaway Golf. • Hawk Eye soleplate glides over the grass without digging, and makes this driver playable off the fairway. Callaway X Fairway 3 Wood 15° Uniflex Left-Handed Steel. Flex Uniflex. Fairway Woods. Type Fairway Wood. Shaft Callaway Golf. Grip Callaway Golf. Shaft Material Steel. Loft 3 Wood 15°. Callaway STEELHEAD Fairway 5 Wood Uniflex Left-Handed Steel. Flex Uniflex. Model STEELHEAD. Fairway Woods. Type Fairway Wood. • Hawk Eye soleplate glides over the grass without digging, and makes this driver playable off the fairway. These were one of the most sought after clubs that Callaway made, and are being impossible to find. This wood has 19° of loft and is standard length and lie. It has a Callaway Steel Uniflex, and original Callaway grip. Callaway X Fairway 5 Wood 19° Uniflex Left-Handed Steel. Flex Uniflex. Fairway Woods. Type Fairway Wood. Shaft Callaway Golf. Grip Golf Pride VDR. Shaft Material Steel. Loft 5 Wood 19°. Steel Shaft - UniFlex Flex. Callaway X 19° 5 Fairway Wood. All single pieces (drivers, fairway woods, hybrids, single irons, wedges, putters. Left - Handed. Headcover and Tool are Not Included. ). Callaway STEELHEAD III Fairway 3 Wood Uniflex Left-Handed Steel. Flex Uniflex. Model STEELHEAD III. Fairway Woods. Type Fairway Wood. Grip Callaway Golf. Shaft Material Steel. Loft 3 Wood. Callaway STEELHEAD PLUS Fairway 3 Wood Uniflex Left-Handed Steel. Flex Uniflex. Model STEELHEAD PLUS. Fairway Woods. Type Fairway Wood. Shaft Material Steel. Loft 3 Wood. Shaft Condition 8.5 / 10. Callaway STEELHEAD Fairway 5 Wood Regular Left-Handed Steel. Model STEELHEAD. Fairway Woods. Type Fairway Wood. • Hawk Eye soleplate glides over the grass without digging, and makes this driver playable off the fairway. Steelhead Plus. Fairway Woods. Shaft Type. Shaft Notes. Shaft Flex. We do provide images of the actual shaft for all of our golf clubs to help better identify the exact shaft in the clubs. Head Covers. 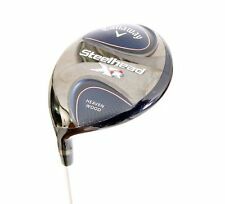 CALLAWAY X SERIES 5 WOOD/FAIRWAY 19 DEGREE - FITTED WITH FUJIKURA REG SHAFT AND ORIGINAL GRIP AND HEAD COVER. USED - LEAFT HAND. Big Bertha Steelhead. Left Handed. Head - 5, shaft - 6, grip - 9. Matching included (tatty). Lamkin crossline. 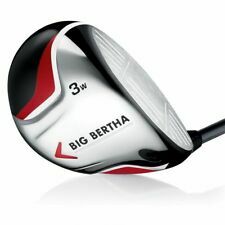 Callaway big bertha steelhead 7 wood - left handed. Not been used for years and having a clear out. In good but used condition as pictures show. Comes with headcover.